The Russian ruble weakened in early trade on Monday ahead of Vladimir Putin’s inauguration for a six-year presidential term that will be followed by the appointment of a new government later this week. The configuration of the new government is one of the key uncertainties that still hang over the market. Whoever Putin’s protege for the prime minister seat is, the decision is widely expected to be supported by the parliament. “The market is pricing in appointment of strong economists for the key roles in the government,” Alor Brokerage said in a note. 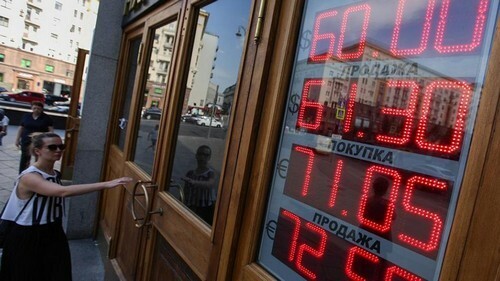 On Monday morning in Moscow, the ruble was 0.4 percent weaker against the dollar at 62.75 and eased 0.1 percent to trade at 74.28 versus the euro. Room for a recovery in the ruble, hit hard by U.S. sanctions in April, is limited by expectations that the Russian finance ministry will increase daily purchases of foreign currency for state coffers this month. Prices for oil, Russia’s key export, play on the upside for the Russian market. Brent crude oil, a global benchmark, was up 0.7 percent at $75.40 a barrel. Higher oil pushed Russian stock indexes higher. The dollar-denominated RTS index was up 1.0 percent to 1,157.9 points, while its ruble-based peer MOEX rose 0.7 percent to 2,305.8 points.